Preheat oven to 200°C. Line 2 baking trays with baking paper. Cut the potatoes in half then into 1-2 cm wedges. Place potato wedges on one of the prepared trays. Drizzle with oil. Sprinkle with salt. Add to the top shelf of the oven and bake for 30 minutes, (Tip: Set timer for 10 minutes time to add the fish in step 3), flipping half way through, until crisp and golden. Zest the lemon, then quarter. Chop the parsley leaves, discarding stems. Whisk egg in a large bowl. Place flour in a large bowl (or plate). Pat dry fish with a paper towel. Combine breadcrumbs, lemon zest, half the parsley and parmesan in a large bowl (or plate). Season with salt and pepper. Dust fish with flour, dip in egg and coat in breadcrumb mixture. Place on the prepared tray and bake the fish along with the wedges for the last 20 minutes until the crumb is golden and fish is cooked through (cooking time will vary depending on thickness of fillet). With 5-10 minutes roasting time left, bring a pot of water and a pinch of salt to boil over high heat. When water is boiling, add broccolini and cook until bright green, about 2 minutes. Drain thoroughly. 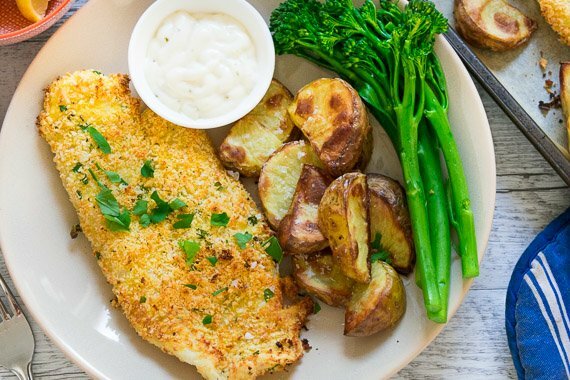 Divide fish, broccolini and wedges among plates. Serve with a dollop of tartare sauce. Enjoy!